By Phra Theppariyattimolee (Sutas), The Abbot. Wat Moli Lokayaram is a royal temple of the second tier, which is known as “Rajworawihan”. This 300-year old temple was built in the Ayudhaya period. When King Taksin established the Thonburi Kingdom, he incorporated this temple and Wat Arun into his palace boundary. During his reign, there were therefore no monks residing in the temple and was considered as the temple within the palace as usually practiced in the Ayudhaya Kingdom. This temple was widely known during the Thonburi period as “Wat Tai Talad” which literally means the temple behind the market. 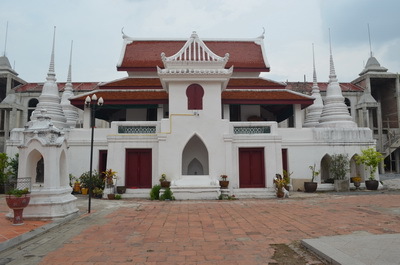 This temple stretches for 5.1 acres and situates behind King Taksin’s old palace on the western side of the Chao Praya River, which is called Thonburi. In the reign of King Rama I, the capital city was moved to the other side of the Chao Praya River, which was called the Pra Nakorn east bank or the Main City. He ordered his son, Prince Isarasundhorn, who was later King Rama II, and HM. Queen Amrindramard (Nak) to restore this temple and build a new Ubosot or chapel, respectively. The chapel is covered with the ceramic roof tiles with timber gable spires and their ridges, lacquered and decorated with stained glass. The wall and the ceiling inside the temple are painted in the traditional Thai print. Wooden doors and windows were beautifully carved with gilded lacquer. 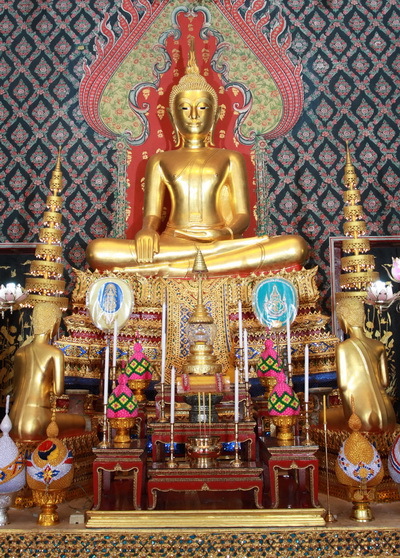 The Principle Buddha Image in the Temple, named “Phra Buddha Molilokanadh”, is a bronze Buddha image in the attitude of subduing Mara having the front lap width of 2 metres with very beautiful Buddha characters. This image is very sacred and has been respected by the kings and Thai people since early Rattanakosin period. King Rama II renamed this monastery “Wat Buddhaisawan” or “Wat Buddhai Sawan-yawas Worawihan”, which implies the close relationship with the royal family. Almost all of his sons, including Kings Rama III and IV and HM Vice King Pinklao, had their elementary study here. King Rama III had restored the whole temple and again renamed it “Wat Moliloksudharam”. He built Somdej Hall in 1843 AD for the statue of his teacher, Somej Phra Buddhakosajarn (Kun), who not only taught him at his early age but also his First Ordination Teacher when he was ordained. This sacred place has two storeys, i.e the ground base and the upper hall. The ground floor stands the bronze statue of Somdej Phra Buddhakosajarn (Kun) and is the foundation of four Lankan style stupas, which are believed to keep the top knots, called Moli in Thai of Kings Rama III and IV. And that is how the name of the temple was derived. Both sides of the hall have two staircases to the upper floor and the front tunnel stands the sculptural footprints of Lord Buddha. The timber Tripitaka Hall was also built in his reign with very beautiful gilded black lacquer art on doors and windows. It is worth seeing very much. 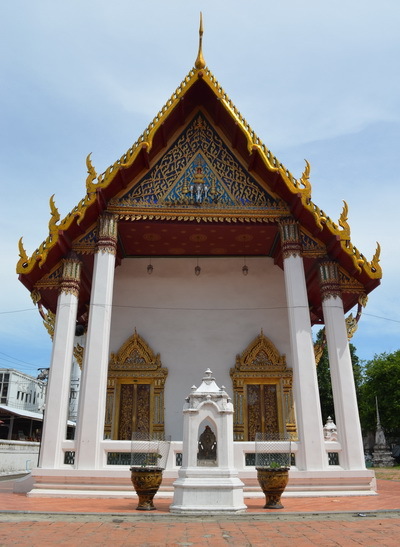 King Rama IV built a new chamber for the abbot, a Chanting Hall and subsequently a larger Central Hall serving both chanting and dining purposes. He restored the chapel by allowing his royal emblem of the mythological elephant with the royal canopy be placed on its gable. It is very likely that the present name of the temple –“MoliLokayaram” was given in this reign. As previously mentioned, this temple had been served as an elementary school for many princes of King Rama II during early Rattanakosin period. It also provided the Pali language teaching with oral examinations. In 1991 Wat Molilokayaram was appointed to be the monastic educational institute with an aim to provide the education of dhamma scriptures of both Pali language and dhamma essence (Nakdham) and plans to supply very qualified Buddhist descendants. At present, although this institute is of medium size and generates 100-200 monks examinee to enter the annual central Pali-examination, it wins respectively the record of achieving the highest number of students passing the Pali-examination in Bangkok Metropolitan in 2007, 2009, 2010, 2011, 2012 and the outstanding students had received the administration scholarship. At present there are altogether 20 teachers and 100-140 student monks/novices. The institute also provides Pali courses for students from other temples in Bangkok Metropolitan and upcountry. The Pali section has eight levels giving classes on Pali grammar up to the ninth level of Buddhist theology, while Dhamma section has three levels of classes, i.e dhamma scholar of the third, second and advanced levels. The monastery has very limited space and facilities and needs to improve both classrooms and accommodations tremendously in order to cope with more than 200 monks/novices each year. The Pali tuition is given to more than 250 monks and novices holding Buddhist Theology of lower levels 1-2 up to level 9 from end of December to beginning of March of the following year. Sponsorship providing foods and drinks or financial support for monks during this period is greatly appreciated. The ceremony is annually arranged on the second Sunday of September. Scholarships and the three robes will be given to the outstanding monks/novices, who can pass annual Pali-examination. Merit making is performed for the late abbots of the temple. You can donate money to support these Routine Activities of the Institute everyday. Contact Phra Medheewaraporn, the abbot.